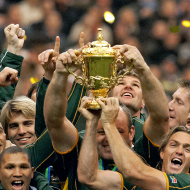 Ethics and sport: Can football learn lessons from rugby? Ethics and governance issues for football on and off the field. Rugby taking the lead in more efficient decision making through technology. Tougher rules in rugby help to enforce respect towards officials. James Barbour runs the rule over some of the current problems besetting soccer and lessons that could be learned from rugby union. Ethics and football have been generating considerable discussion in recent times as Fifa's global governance of the game remains in the spotlight. Only time will tell the outcome of the ongoing legal investigations, which one can only hope will arrive at the truth and ultimately allow the process of restoring trust to begin. Football, however, also appears to have ethics and governance issues that need to be addressed on the field. With the level of finance now invested in the game, mind boggling sums depend to a large degree on split-second decisions such as the clear penalty which was not awarded late in the Porto versus Chelsea Champions League match on Tuesday evening. On many occasions, it is small margins that determine the difference between the winners and losers at major sporting events. It is therefore essential that the risk of errors by football match officials that ultimately influence results is mitigated as much as possible. The increasing use of additional assistant referees, even behind the goals, does not appear to have led to any improvement. At a time when the Rugby World Cup has captured global attention with the minnows now capable of upsetting the odds, there is an opportunity for the beautiful game to learn lessons from rugby. Both sports have different sets of rules but it is the application of those respective rules which I find to be of major interest. Rugby union adopts the approach whereby the referee is seen as someone to whom respect must be shown. Failure to do so results in the award of a penalty in which the game line is advanced in favour of the opposing team by 10 yards – something football officials dabbled with but did not commit to. In contrast, football seems to delight in the pantomime that, unfortunately, results on occasion in players accosting the match officials. This is surely not the example we should be setting to youngsters as we try to encourage them to take part in sporting activities. Secondly, the use of video evidence to assist the referee to help ensure that the correct decision is made is also something that football would do well to take on board from rugby union. Yes, certain football associations now use goal line technology to help the referee adjudicate whether the ball has crossed the goal line. This in my view is a step in the right direction but more needs to be done. The use of technology is widespread in the coaching of the game. Surely, moves need to be made to bring the application of the rules into the 21st Century and ensure that the laws of the game are properly observed. Finally, the use of the yellow card "sin bin" time penalty approach is also something that might help to improve the overall behaviour of players in football. The loss of a player for a defined period of time would also in my view add to the potential excitement. You may not agree with my suggestions but there is little doubt that something needs to be done.